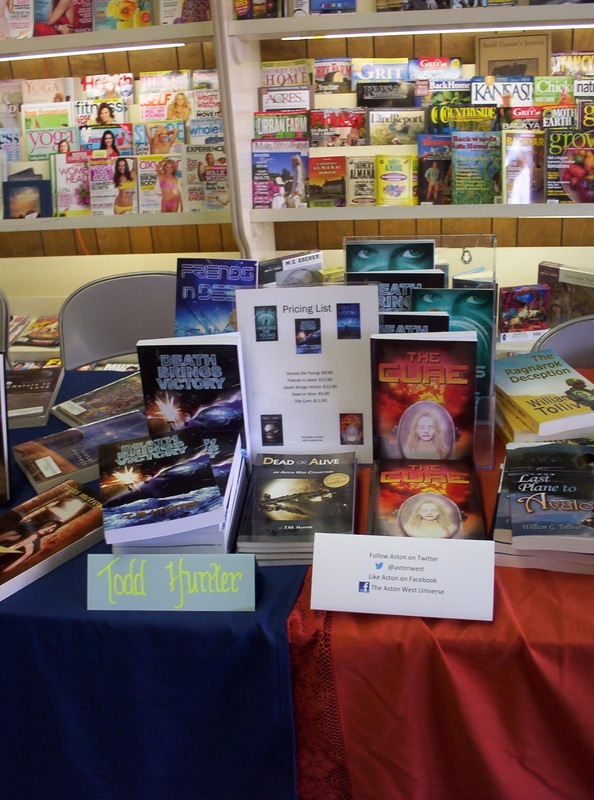 For those who don't often follow my tweets and fan page postings, I was up in Emporia, KS this past Saturday for their annual Author Extravaganza (this is my third straight year). 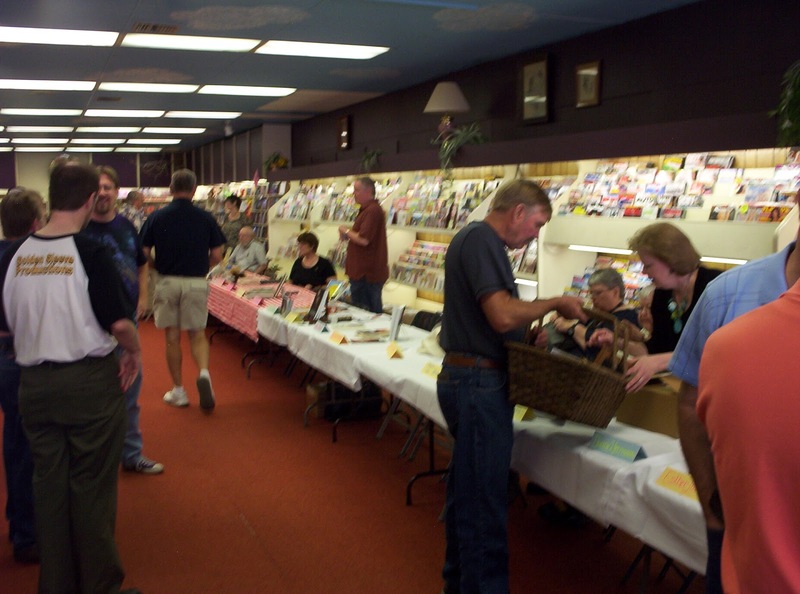 For those not familiar with the event, it brings together a multitude of Kansas (and surrounding area) authors for a group signing. 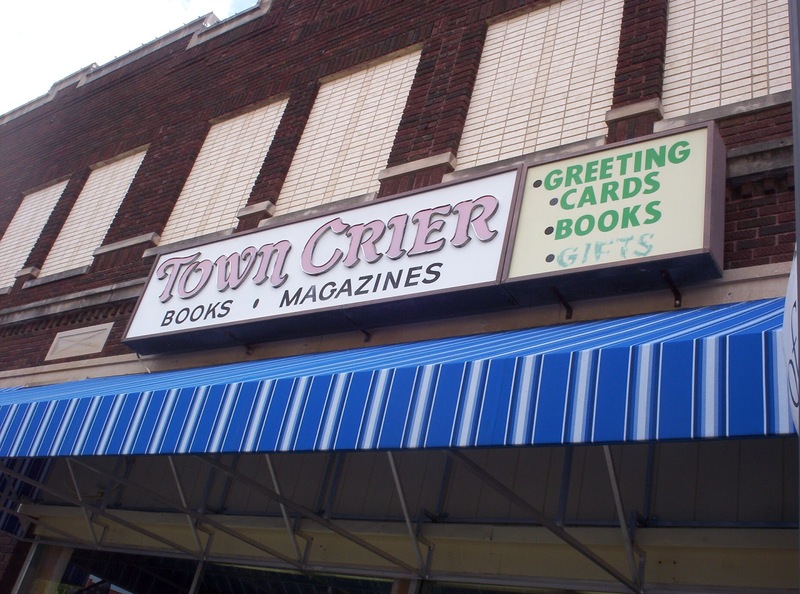 The shop who hosts the event, Town Crier, is a bit on the smaller side, so it can tend to be an extremely cozy event. This year was no different, with a projected 51 authors in attendance. Tucked in elbow to elbow is always an experience, but you get used to after a while. A pair of pictures taken before the event officially started...thus, plenty of room at the tables. Overall, I thought it was a decent event. Sold more than I had in several recent outings, and Town Crier always seems to pick up at least one signed copy of each book for stocking on their shelves. I did notice that this year, they reduced the quantity of extra copies they purchased, which may be a sign of things to come in the future. I've said it before and I'll say it again. Keeping positive during these events is key. It would have been easy for me to get down, since the first 45 minutes or so (of the two-hour event) had no sales. But I kept smiling and maintaining a positive attitude, and sales exploded from then on. Other authors were discussing what made a "successful" signing, claiming it was selling two books an hour. By that criteria, I definitely had a successful event. Interact with customers in a non-threatening way. Customers are really put off by authors who are constantly throwing books in their face with a "buy, buy, buy" persona. I saw this on more than one occasion through other authors around my area. Ask questions about what kinds of books they like to read. Use humor to put them at ease. Give them straight facts about what your books are about, but don't overload them with information. When in tight quarters, use some decorum and etiquette. No, I'm not talking about using copious amounts of deodorant (though that's always important too). When customers are perusing one author's books, wait for them to finish before thrusting yourself upon them. It's important to maintain healthy relationships with other authors, and being rude is one way to cement a negative impression for later. Utilize group signings such as this for not only the sales opportunity, but also for networking with fellow authors, as well as discovering promotional techniques that work well (or don't work at all) for other authors. I plugged the SFFS blog to other sci-fi and fantasy authors around me. Hopefully they'll take that advice to heart, since it's been a useful promotional tool for me personally. 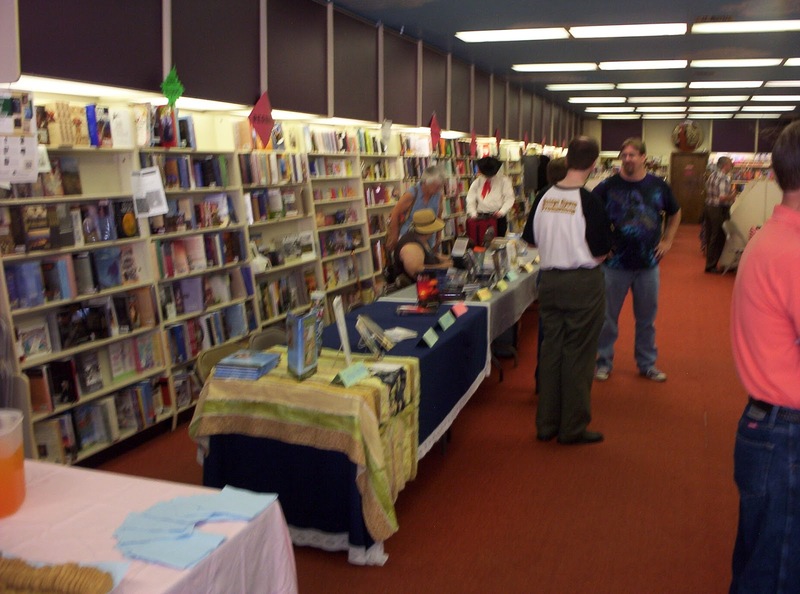 Another Kansas author I know, Robert Collins (who was not at this event due to other engagements), had mentioned a tip he heard about placing your books in uneven stacks. I tried to make this happen at this event (with the room I had available). Whether it contributed to my sales, I don't know...but it certainly seemed to help anyway. It's said over and over, but building readership is going to help you sell more books in the future. 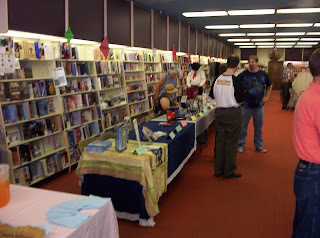 I had more than one person who had purchased my earlier novels at past events, and wanted to buy the new ones as well. One thing I was surprised about was a total lack of sales for my second "series" novel. Each of my other books sold but this one. Not sure what led to this, but I do wonder if it contributed to the situation I mentioned in one of my earlier posts comparing my sequels. Again, I thought it was a successful event, and can't wait for next year. Laurel, how may I contact you via email? TK, I think the premise behind the uneven stacks is that it appears that people have been perusing and/or buying the books. Ahh, gotcha. That makes sense. Congrats! I need to go to a couple more author events. At this one, I sat next to a publisher from Kansas City who had 2-3 of his authors in attendance.